During our recent, very hard freeze–when Nature grudgingly granted us highs in the teens and single-digit lows for several weeks–the main waste line for our barn apartment froze solid. That was 40 feet of waste line. I knew it was frozen because the apartment toilet wouldn’t flush. And then sewage backed up into the tub. I called in Gary, my plumber. He’s a good plumber, expensive and nearing retirement–it’s clear he doesn’t have to work any more. He’s the guy you call when you’re really in trouble. The troubled wasteline. Yes, that’s a bird’s nest. He was right about that: the lower level of the barn was overly exposed: wind was blazing through an open window directly below the bathroom; and the east side of the barn was open in three places–repair work I hadn’t gotten around to. Gary said I could cut the waste pipe into sections and empty it. They’d be heavy and it would take a day or more of work in 15 degree weather. If I called in a crew to replace the waste pipe, it’d cost me a couple thousand dollars. Gary said my best bet was to let the line thaw out. That might take weeks. After Gary left, I took a drill to the waste line at the nearest end. When I withdrew the drill from the plastic pipe, there I saw it: ice in the grooves of the drill bit. Then I went to the other end and discovered the same: ice in the grooves of the drill bit. It was getting dark. I decided to start fresh the next day. 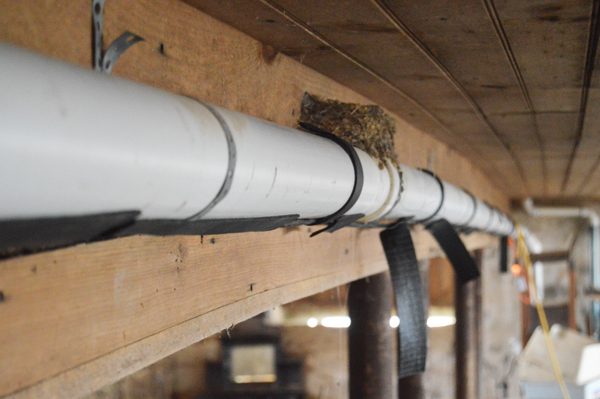 The next day I returned to discover that the toilet seal had broken and now stalactites of sewage had formed below the bathroom–huge sewery icicles hanging into the lower level of the barn. Some of the icicles were five feet long. To keep more from forming, I had no choice but to drain the line. That meant placing a 50 gallon barrel on a wooden box just below the clean-out cap. I wasn’t sure how much sewage was in the pipes. I knew only that the tub was mostly full. How many gallons does a bathtub hold? I opened the clean-out cap slowly and the water started trickling into the barrel but, when I turned the cap a little farther, the force of the backup kicked the cap out of my hand (it fell into the barrel) and suddenly all of the sewage gushed out. Most got into the barrel. But then, to my dismay, the barrel was filling up, so I ran to fetch a five-galloon bucket, which I held up for the remainder, running outside to empty each fill-up. You want to talk about an awful mess? When I examined the now-full barrel, I realized I couldn’t move it: 50 gallons of liquid weights 400 pounds. I had only one hope: if it stayed cold enough, the entire barrel would freeze, then I could roll it out to one of our fields and let it thaw, then seep into the soil. Sure enough, one day later that barrel was solid ice. As for the stalactites, I broke them off and carted them out (again to a field). But this was just the start. Next, I cleaned out the bathroom, pulled the toilet, disconnected the old cast iron clawfoot tub, then dragged it out, into the barn. Then I rebuilt the bathroom from scratch. This had long been our plan, but we hadn’t expected to do it so soon. 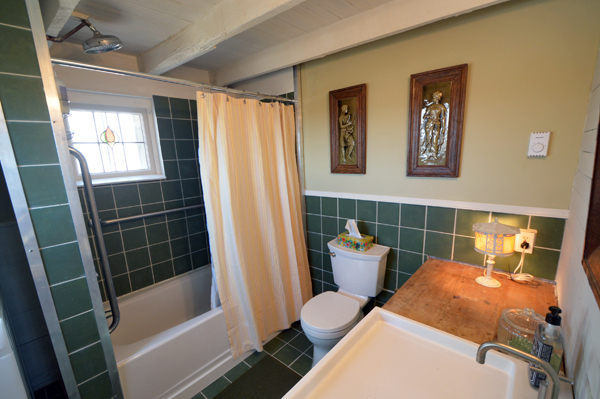 Building a bathroom from scratch is a big job, which is why bathroom remodelers get the big money. I used every tool I own: circular saw, chop saw, reciprocating saw, keyhole saw, tile saw, jig saw, drills, hammers, levels, trowels, chisels, picks, screw drivers, etc. It took me about 100 hours. 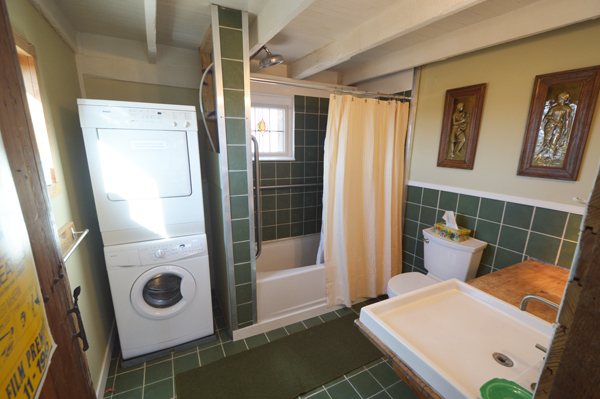 It included a new tub, all new plumbing, new electricity, new heater, new thermostat, newly-built tub enclosure, new insulation, new exhaust fan, new lumber, new backing board, and lots of new tile. Most of the supplies we bought at salvage warehouses, including some gorgeous moss-green, Italian tile. I spent so much time on my knees (wear knee pads! ), my knees are now callused. But it’s done. And that waste line is now heated and insulated. 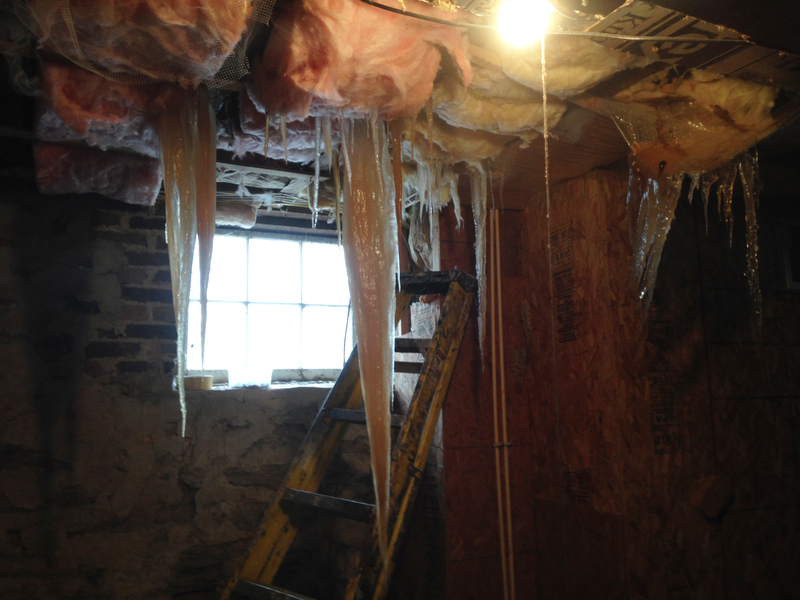 So–we hope–never again will we see stalactites of sh*t.